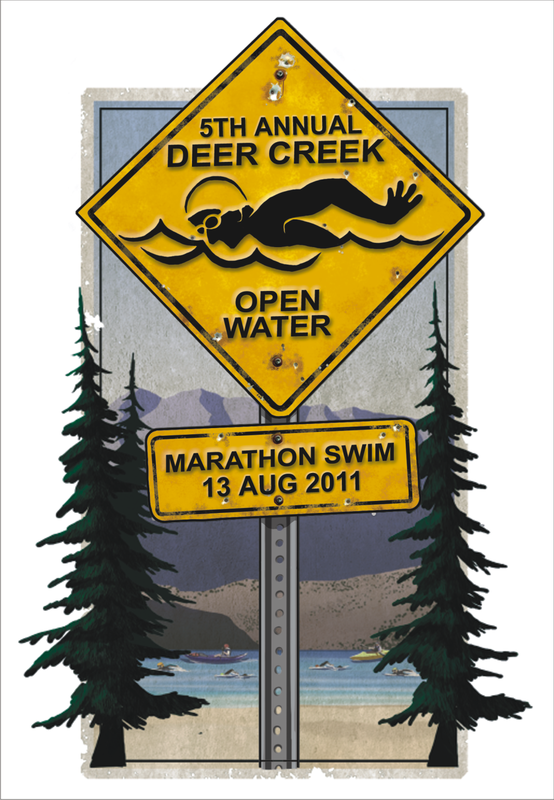 I look forward to the Deer Creek Open Water Swim every year. Since I first participated in the event four years ago, I've been hooked and it has become my "must do" race each year. I am always surprised at how cold it is at Deer Creek in the morning. It's the middle of August and I still had to put on a jacket to try to keep warm. Luckily the water was much warmer than the air and it felt really nice to get in the water. After helping get people checked in, we had some prizes to raffle off. We gave away a GSL race entry, SafeSwimmer, Aquaspotter and some Achiva Energy. The big prize was a brand new kayak donated by Lifetime and Gords Swim Log! After the safety meeting, I finished getting ready and watched the 10 mile swimmers start. I got in the water and swam around a little bit to try to warm up (not nearly enough). There were relatively few 10K swimmers this year and I knew about half of them. Even with only a handful of 10K swimmers, it was still crazy at the start and I bumped into more than a couple people. I didn't sight nearly enough at the start and ended up swimming into a bay instead of cutting across like everyone else...ooops. It seemed like it took forever to get to the 5K turn buoy at the end of the bay! I didn't realize just how far down the bay it was until we were on our way home. I stopped for my first feeding, a mix of gel and Gatorade, and kept going. My goal was to only stop three times to feed and to keep the stops short. I had mixed three gels with some Gatorade in a small squeeze bottle. It was much faster this way that ripping open a gel and squeezing it into my mouth. I started to catch up to some people on the way to the 10K turnaround and there were about four of us that were pretty close at the halfway point. One of the swimmers was Mark Belnap and he and I stayed pretty close until the last half mile when I lost track of him and he cruised ahead of me. My shoulder started to hurt, but I tried to ignore it and keep going. I felt like I was moving at a pretty good pace until the last half mile when I really started to slow down and get sloppy with my stroke. The wake from all the boats didn't help matters either. I really wanted to finish under three hours, but didn't quite make it. My final time was 3:03:38 which is a new personal best for me by about six minutes. There were some really amazing and inspirational swimmers this year. From the super fast to those who were there to challenge themselves by pushing themselves to new distances. As always, it was good to see my swimming friends and to cheer them on. Thanks to my wife who paddled for me and for the rest of my family who came to support me and take care of our boys while we were on the water. Thanks to Jim Hubbard who started this race five years ago and has done an excellent job as race director. Next up for me is Slam the Dam in early October.